How can humanitarian standards support the empowerment of local actors, including affected people? With the localisation agenda receiving much attention and the 2018 Sphere Handbook focusing even more on using standards in context at the local level, this question was discussed by a group of 20 experts. Humanitarian standards initiatives describe their work as people-centred by nature. Correctly applied, standards  help affected people and communities to be meaningfully involved in decisions affecting their own recovery. Generally, this means that they are consulted at different stages of a programme and that complaints mechanisms must be put in place. Can we go further? How can humanitarian organisations use standards like Sphere to address the fundamentally uneven distribution of power in crisis response, going beyond consultation and feedback mechanisms for affected populations? And to what extent can standards initiatives promote the standards as a tool to empower affected communities directly by providing them the legal, moral and practical justification to claim certain rights? The discussion among 20 humanitarian experts in October 2018 provided Sphere with food for thought for the roll-out of the Sphere Handbook in 2019 and the development of tools for a broad range of actual and potential Handbook users – including affected populations themselves. One key finding was to recognise the complexity of combining a rights-based approach with localisation. The term localisation sometimes means different things, and varying degrees of international involvement. But in any case, it relates to working in and supporting complex social and political contexts with different interpretations of rights. It may therefore not always be possible to directly transfer rights language into certain political and social contexts that do not share these same concepts. The Rohingya response in Bangladesh was discussed as one example. However, in the absence of a direct rights-based dialogue with affected people or the direct appropriation of the rights-based language by affected communities, standards can provide an objective approach to identifying needs. As such, they make a significant contribution to including all population groups, based on need. It is those needs that people have a right to see addressed. Sphere and its partner standards translate rights and rights-based processes into practical actions represented in their various technical sectors. 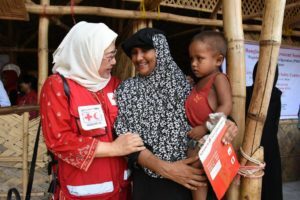 The unique blend of foundation chapters (Humanitarian Charter, Protection Principles and Core Humanitarian Standard) and technical guidance puts standards initiatives into a good place to offer a supportive, common sense approach to principled and practical humanitarian work. In that way, standards can make a real contribution to de-politicising a response, identifying and addressing needs and bringing full meaning to the concepts of accountability and participation. The experts agreed that INGOs should develop a certain humility when working with and for affected people, and recognise that they may not fully grasp the contexts they work in. However, the group stopped short of suggesting that standards could provide the tools and means to affected people for taking relief and recovery into their own hands. Acknowledging this, and gratefully acknowledging the contributions made by the expert group, Sphere will integrate the discussion findings into a community engagement strategy aiming to empower rights holders beyond providing information to humanitarian actors. Sphere and its partner standards – the Humanitarian Standards Partnership (HSP) – cover 11 sectors and supporting themes: WASH, nutrition, food security, shelter, health (Sphere), child protection (CPMS), economic recovery (MERS), education (INEE), livestock (LEGS), market analysis (CaLP) and inclusion of older people and people with disabilities (ADCAP).